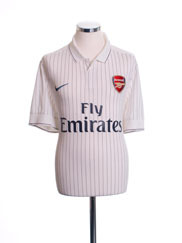 The Arsenal shirt sponsor from 2011 to 2012 was Emirates. Walcott worn/issued Asia Tour 2011 shirt. Vermaelen match issued Poppy shirt. Chamakh match worn Asia Tour 2011 shirt. Relive Aaron Ramsey’s 2011/2012 Premier League season with this original Nike Arsenal home long sleeve football shirt.